Apps4Review.com | LORDS MOBILE- WRITE YOUR OWN LEGACY! LORDS MOBILE- WRITE YOUR OWN LEGACY! It has been a very long time since I’ve reviewed any mobile strategy game play. Actually, I was waiting for a new sensational strategy game to be launched in the market. And now when the game has been launched, I should introduce it to the audience first. It’s none other than “Lords Mobile”, which has been developed by IGG.com. So, if you want to join with 80 million global players on mobile? Let’s start with the Lords Mobile game! Lords Mobile is an open-world, real-time strategy as well as a multiplayer online game. 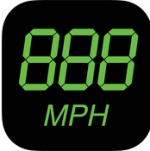 The app has been compatible with iOS 7.0 or any later version of the Operating System of your iPhone, iPad or iPod touch. The game has been set up in a fantasy world which is full of kingdoms battling to dominate the world. You’ll explore exotic magical lands thrown into chaos by terrifying monsters and powerful enemies. As it is a role playing game (RPG) also, then you have to play the role of a hero who is leading his army. Basically at the very beginning of the gameplay, you need to customize your own army and build up your headquarters. After that recruit some powerful heroes with unique skills and character, upgrade your army and fight bosses and conquer the enemy kingdoms. You can choose your favorite heroes, make new friends, unite your allies in your kingdom and ride into war together. You can see, chat as well as clash with other players in this awesome strategy game. You have to rule like an Emperor and see whether your legacy is justified or cruel? Lead your kingdom to glory and try to mix and match them to complete an RPG and SLG style campaign that will make the players play the game again and again. Plan your strategy for playing the game and master that strategy and prepare your troops for the class to win your empire against the enemies. 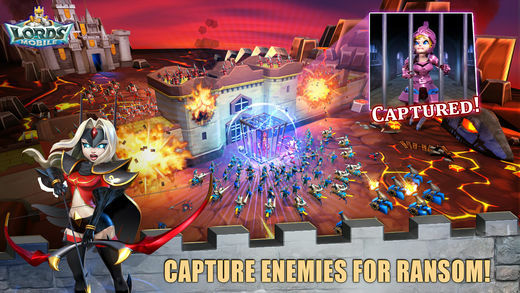 The gameplay offers animated battles where you’ll experience the thrill of war as armies clash in beautiful 3D graphics. You can switch your kingdoms to new lands by moving to any server you want with just a single click. This updated version has made a lot of improvements in its previous version such as: added new event; update Map UI; updated Guild Showdown; fixed issue in Guild Showdown and missing numbers on Guild tabs and various UI improvements. So, will you conquer the enemy kingdoms and imprison the rival Lords? Will you save the prisoners of war? Will your Kingdom and Empire crumble to dust? Let’s see! The app is available for free on the iTunes Store. However, there are so many in-app purchase for you to enjoy more features and experience new wars. So, download it now and write your own legacy! It’s worth every penny! 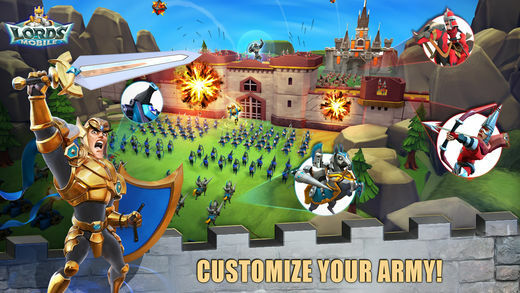 Pros: mobile strategy game; RPG with a common objective; customize your army; beautiful 3D graphics; focused gameplay; easy yet challenging; super-addictive; full of fun and entertainment; free.